We have all been swooning over the potted paper fern plants that we posted last week. They are the perfect way to add a touch of lively greenery to any space! And they just look so realistic. My workspace could always use a bit of sprucing up, and a pint-sized potted plant has been a great addition to my desk at the studio. 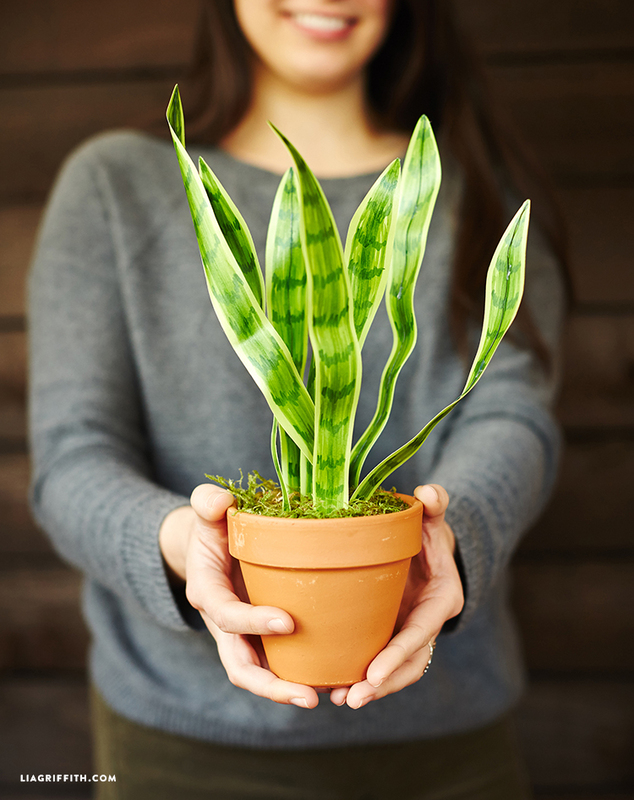 To add to our series of potted plants, we made this cute potted paper snake plant! Potted paper plants are great because they are really easy to make, and you will never have to water them. So if you have trouble keeping plants alive, or know someone else who does, this is the perfect project! 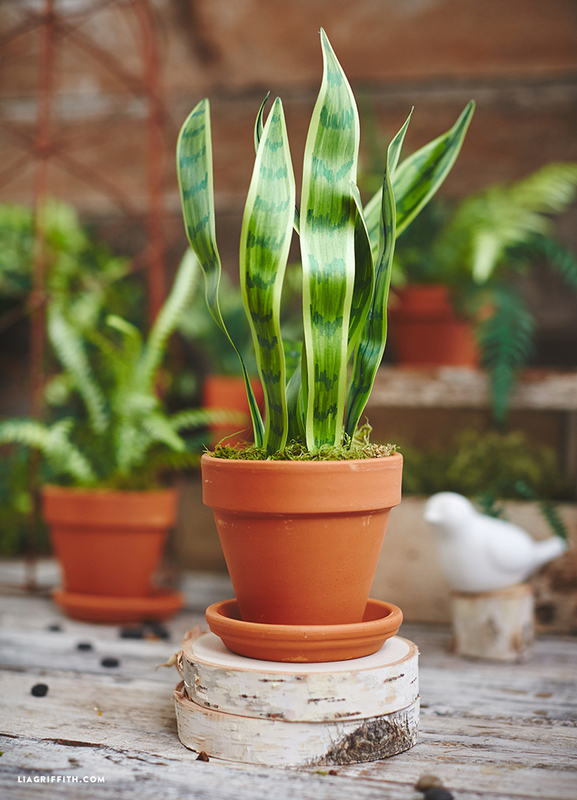 To make this paper snake plant, you will need green text weight paper, 24-gauge floral wire, a foam ball, fake moss, and a simple terra cotta pot. The pattern is simple enough to cut with your scissors–or you can use your cutting machine. 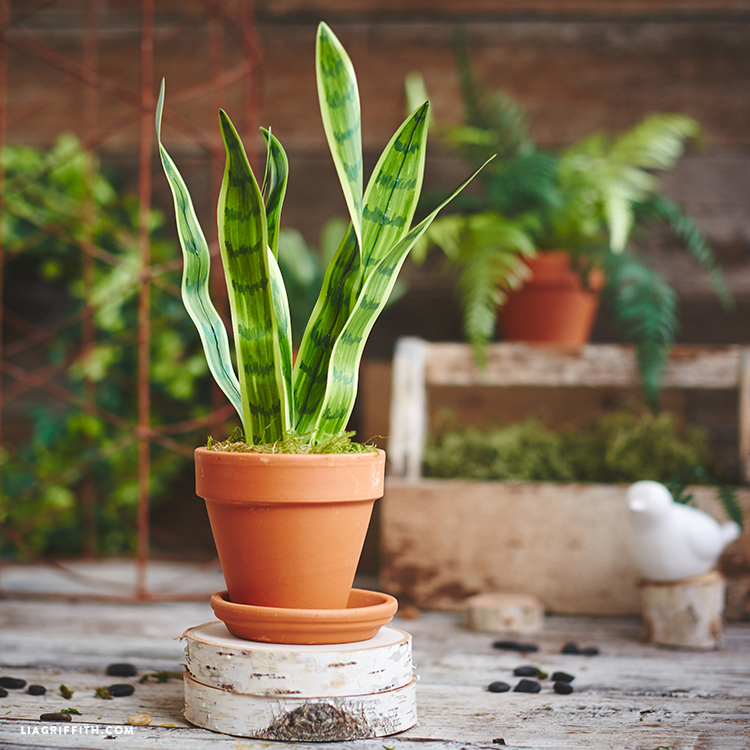 When you’re ready to craft your paper snake plant, just follow our tutorial. If you made our potted fern plants, you’ll notice this plant uses the same technique. After your leaves are cut, you can use brush tip art markers to create a pretty visual texture that is characteristic of a snake plant. Copic markers are alcohol-based, permanent, non-toxic markers that are great for projects like this! Print the PDF template below if you will be cutting by hand, or the SVG file if you will be using your cutting machine. Use the brush tip of the art markers to create a pretty visual texture that is characteristic of a snake plant. Color in the leaves with your Pine art marker, making sure that the outer edges of the leaves are not colored in. Use the darker Moss marker to create horizontal lines across the leaves. After your leaves are looking textured and realistic, glue floral wire to the back side of the leaf, leaving an extra 2″ out the bottom of the leaves. Bend your floral wire a bit to create the wavy look. Place foam ball inside terra cotta pot, and cover with moss. To assemble the snake plant, simply stick the floral wire from the leaves into the foam ball. Oh, how i wish there were photos of the steps taken along the way. Any chance? Sorry Jeanie, we didn’t take any step-by-step photos of this project a few years ago when it was made. I’ll add it to the list for future projects we could expand on! do you color both sides of the leaves? Yay, I am happy to hear you like it!! I don’t see the PDF, and I would love to be able to do this…. thank you so much for all of your amazing ideas!! !